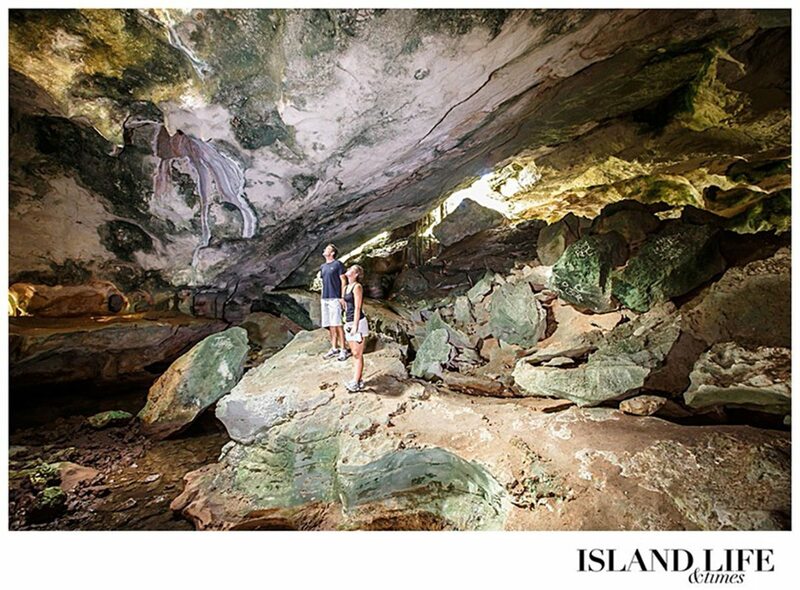 Just beyond the village of Conch Bar on Middle Caicos, at the end of a short dirt road surrounded by brush, a walkway made of stone and fossilised coral leads to the entrance of the largest above-ground cave system in the Lucayan Archipelago (Bahamas-Turks and Caicos island chain): the Conch Bar Caves. 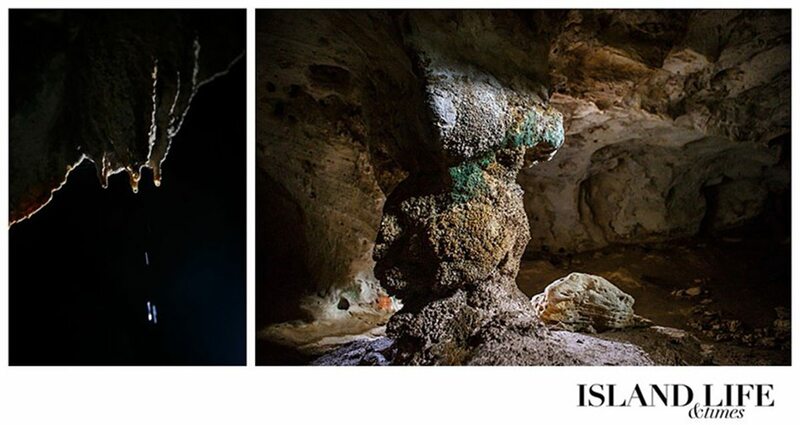 The entrance itself is a sight to behold – a dark, cavernous hole framed by the dangling, interwoven roots of the local Ficus aurea, or strangler fig, that grows from the ground above the cave. But the entrance gives no indication of the vastness that lies beyond. 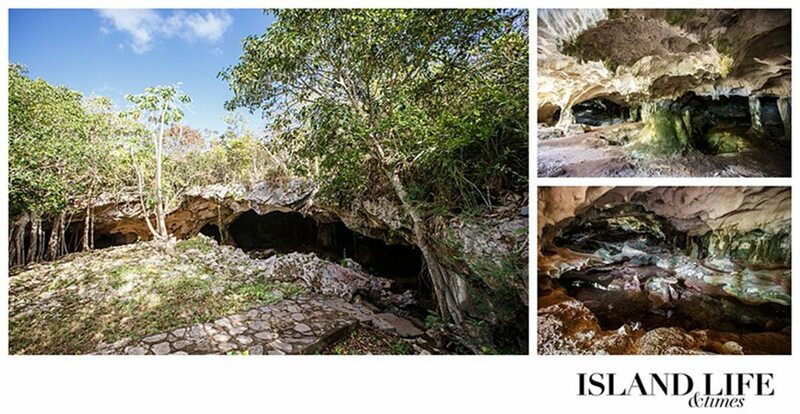 The formation of the limestone Conch Bar Caves, a national park managed by the Turks and Caicos National Trust, likely began at least 100,000 years ago when sea levels were much higher. 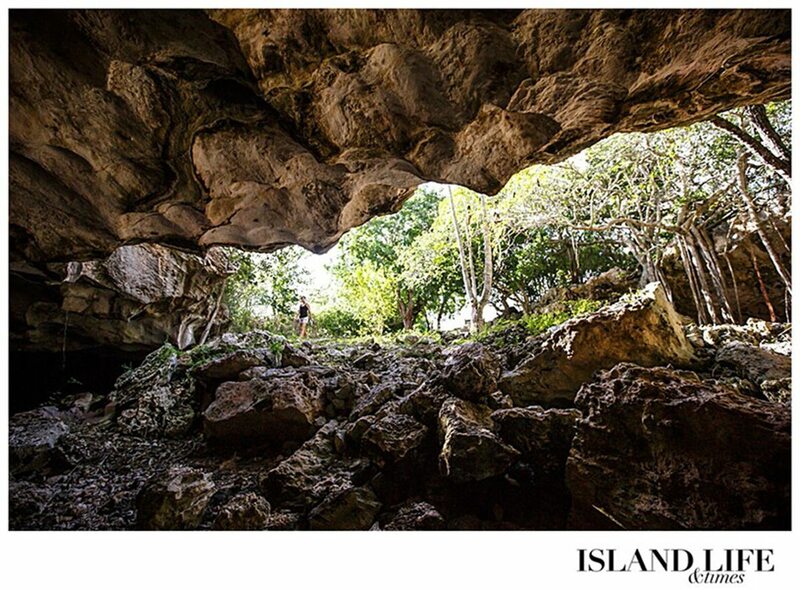 The cave system served as shelter for the native Lucayans, the original inhabitants of the Bahamas island chain before the arrival of Europeans. 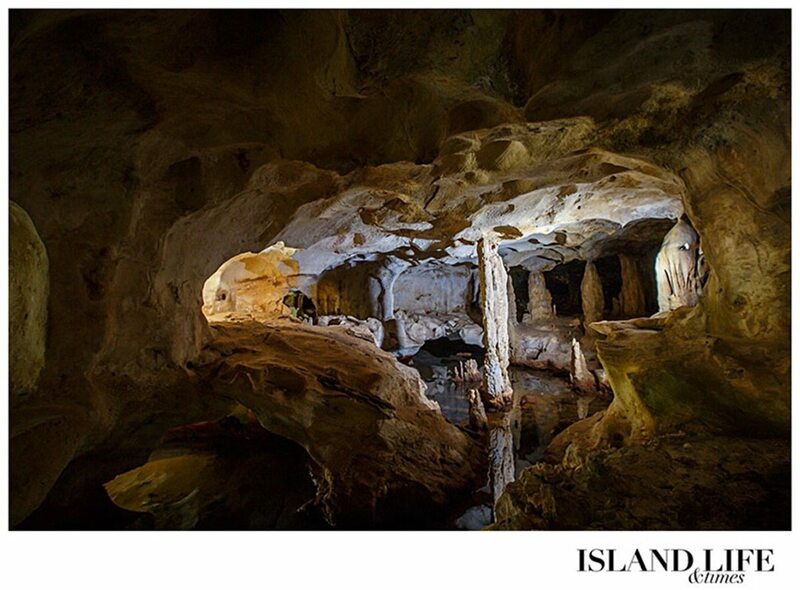 In the 1880s, the limestone caves were mined for bat guano (manure), which was then exported from the islands. 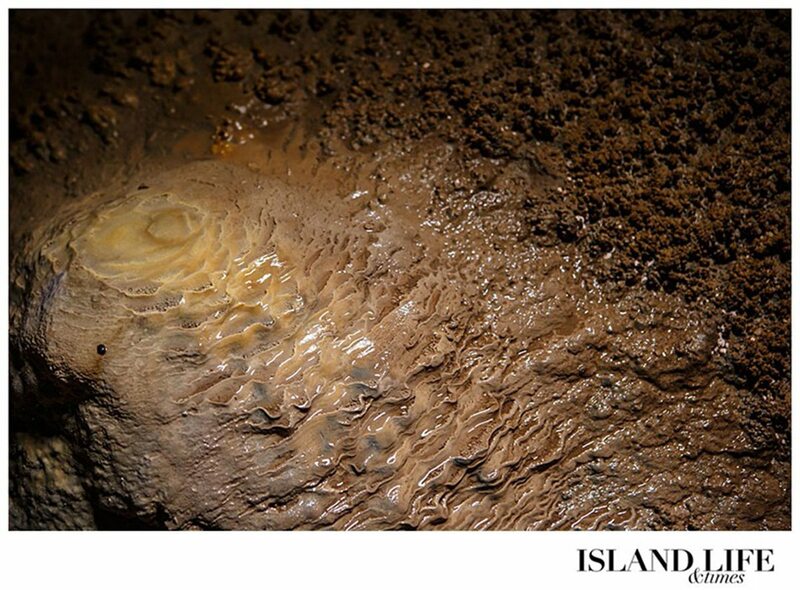 “One of the beauties of the cave is that it’s raw and unmanaged,” says Mark Parrish, co-founder of eco-adventure company Big Blue Unlimited and a marine scientist. 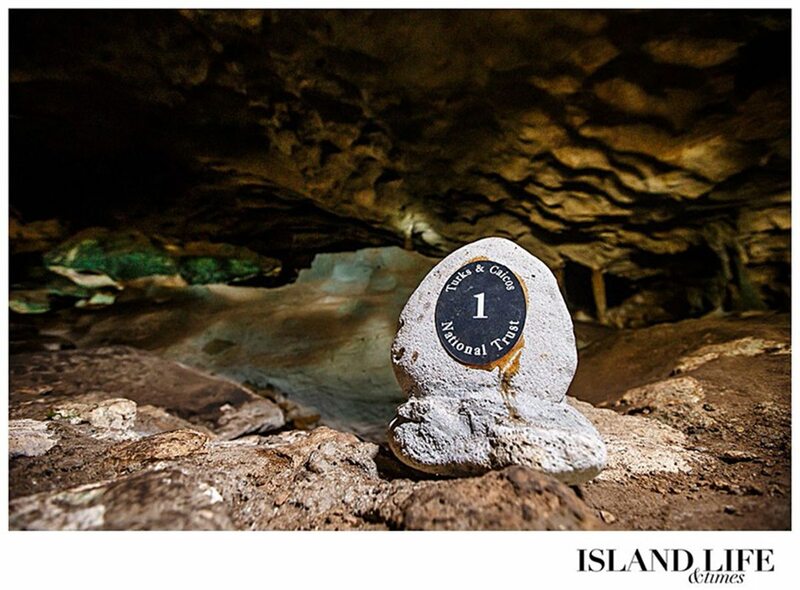 Although the National Trust does manage the caves, offering guided and self-guided tours, what you see inside the caves is simply the caves. There are no developed paths, stairs, lighting or ropes blocking off certain areas. 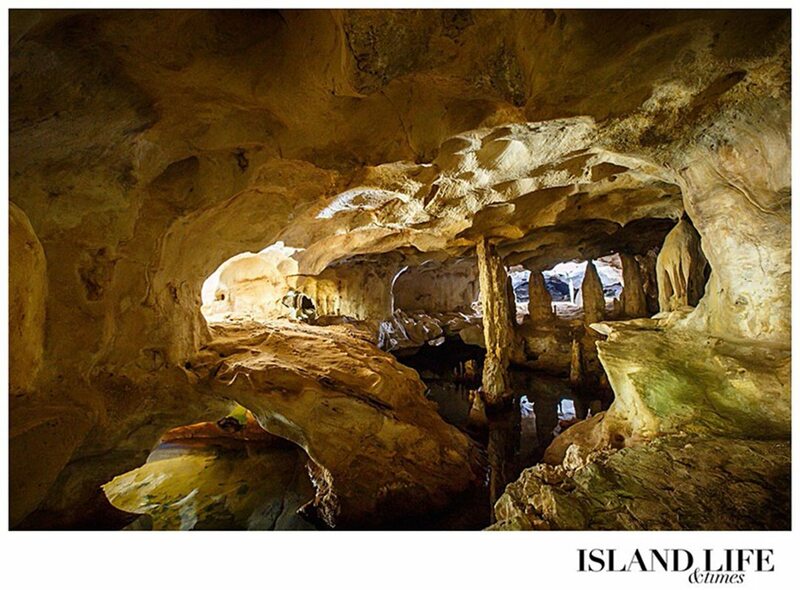 Any graffiti or defacement of the caves, however, is punishable by a $5,000 fine. 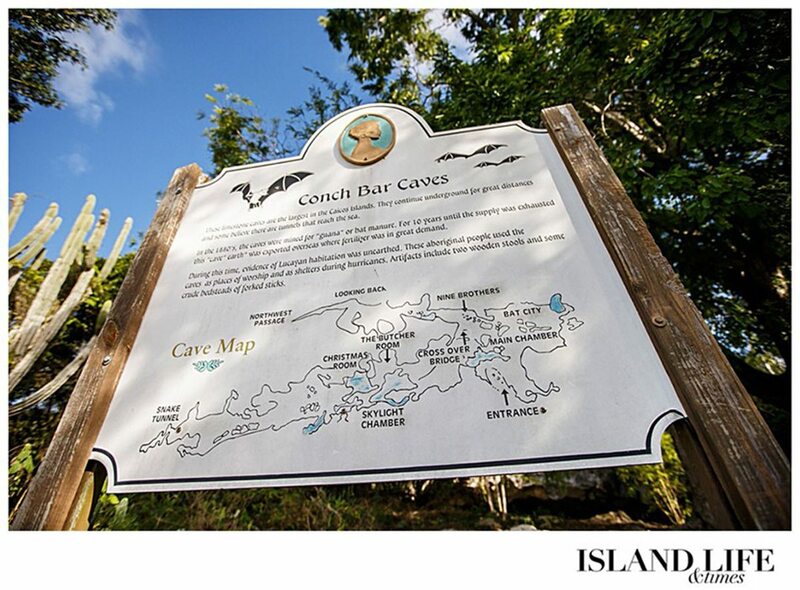 “The National Trust preserves the caves by not adding or taking away anything from it,” says Carrie Harvey, Conch Bar Caves operations manager. 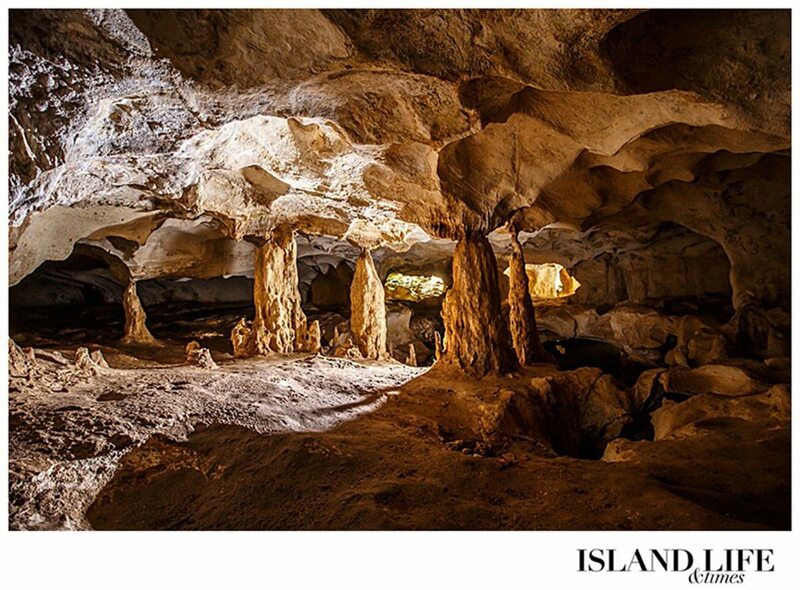 Navigating through the cave system today, the only sounds to be heard are those of water droplets trickling from stalactites – pointed pendants that hang from cave ceilings like icicles – onto the corresponding formations on the floor of the cave, stalagmites. 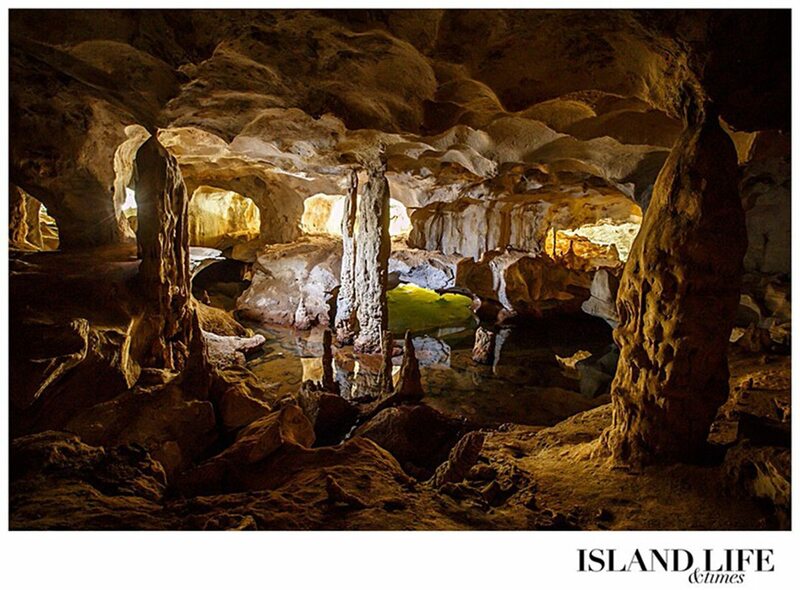 Stalactites and stalagmites are speleothems, or deposits of mineral that form into cave structures. When they eventually join together, they become a full column. A full column represents a few thousand years of growth, Mark says. “When it rains, this little alcove comes to life,” Mark says as we pass a corner embellished with an abundance of stalactites and stalagmites. 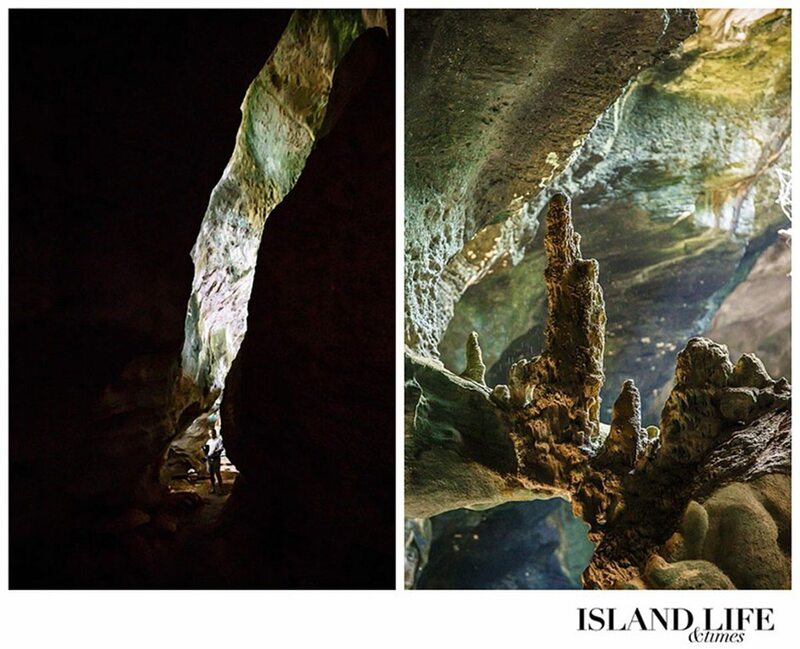 The Conch Bar Caves are a live cave system, which means it is still active and growing, as evident in the water dripping from the cave ceiling and continually forming speleothems. And there’s life inside the caves, too. 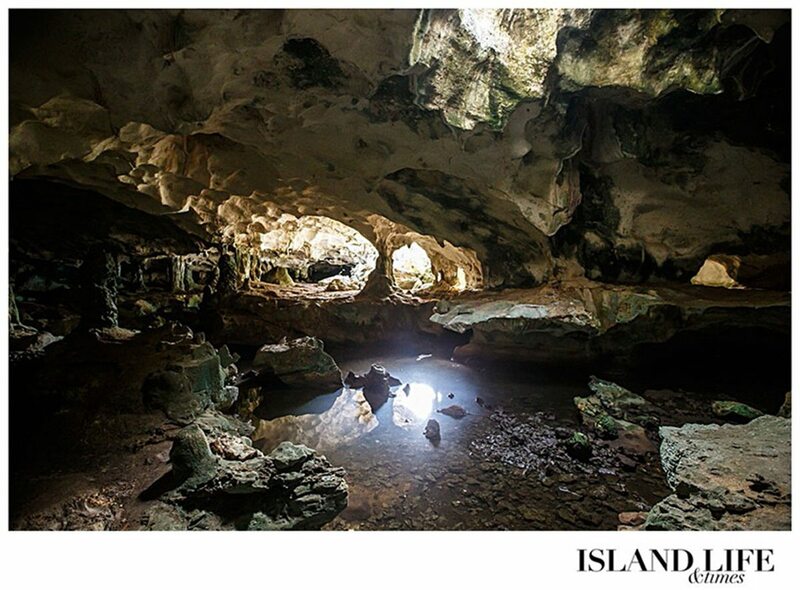 The Conch Bar Caves are home to bats, crustaceans and isopods. 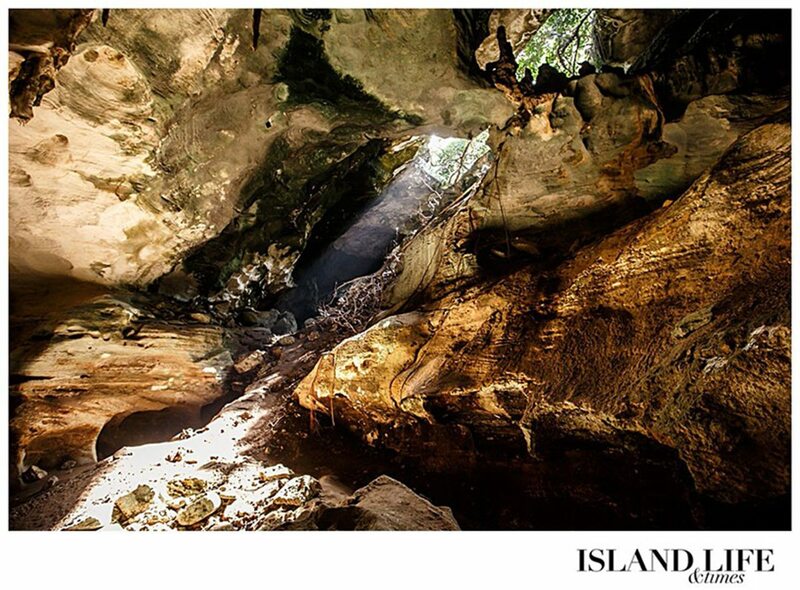 The bats hide out in crevices throughout the caves, but you’ll occasionally hear their squeaks and beating wings. 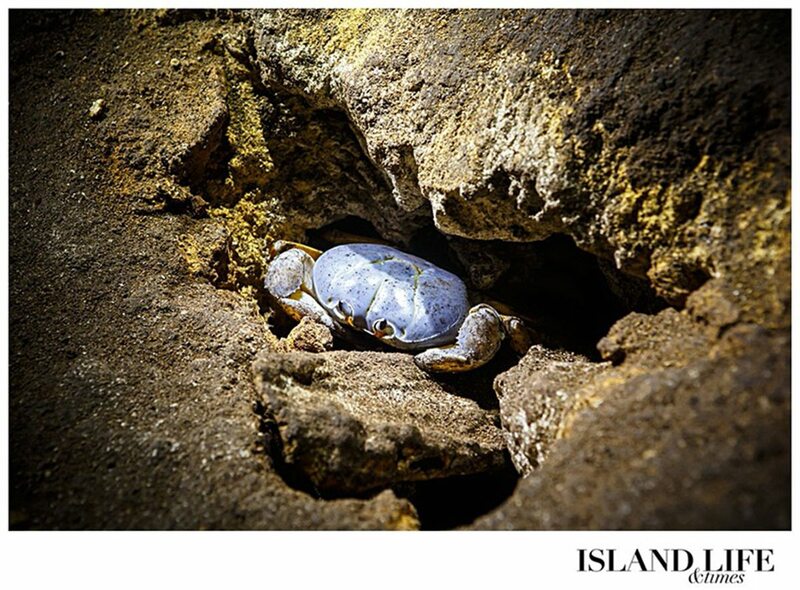 On our tour in February, we stumbled upon a white land crab in a ground crevice – an uncommon find, Carrie says. 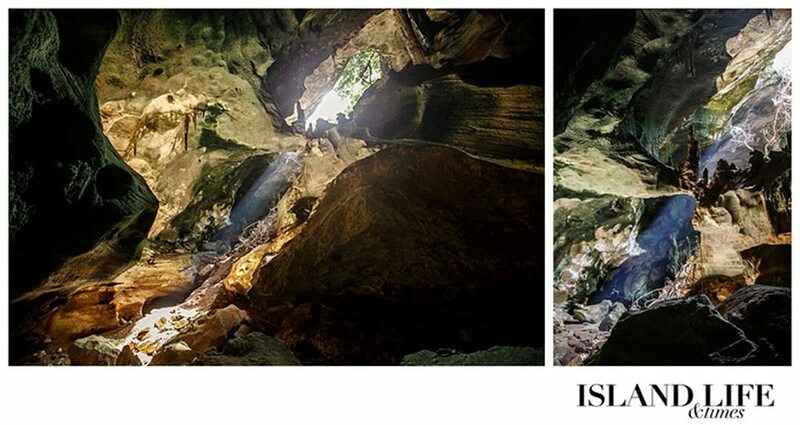 It’s wise to explore the caves with proper footwear as the terrain can be slippery, and the cave floor opens up sporadically to deep holes and ponds. 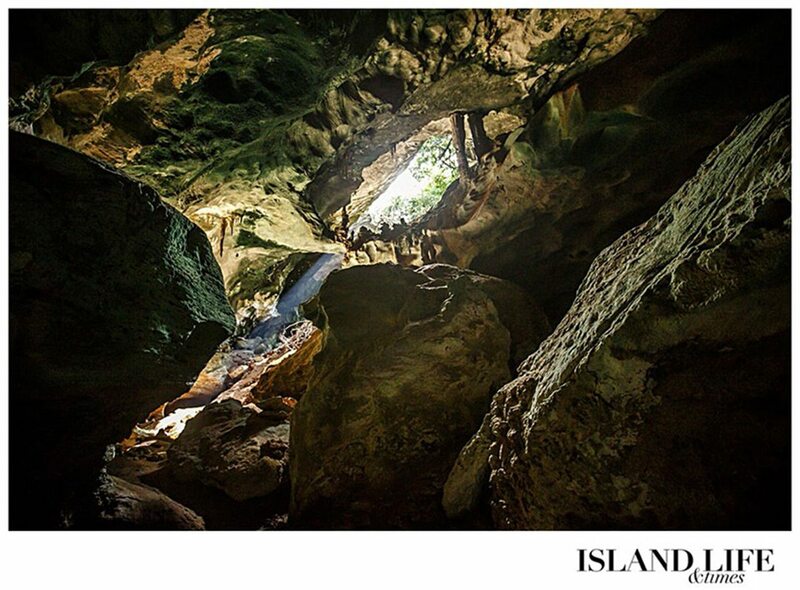 Manoeuvring through the caves, you’ll come across massive boulders that were once joined with the roof of the cave and openings that let in sunlight and tree roots. Hosea Gardiner, an eco-tour guide with Big Blue, grew up on North Caicos, a neighboring island to the west that connects to Middle Caicos via a causeway. But until last year, he had never been inside the cave system. His reaction upon his first cave exploration? Mark, meanwhile, first explored the cave in the late 1990s. 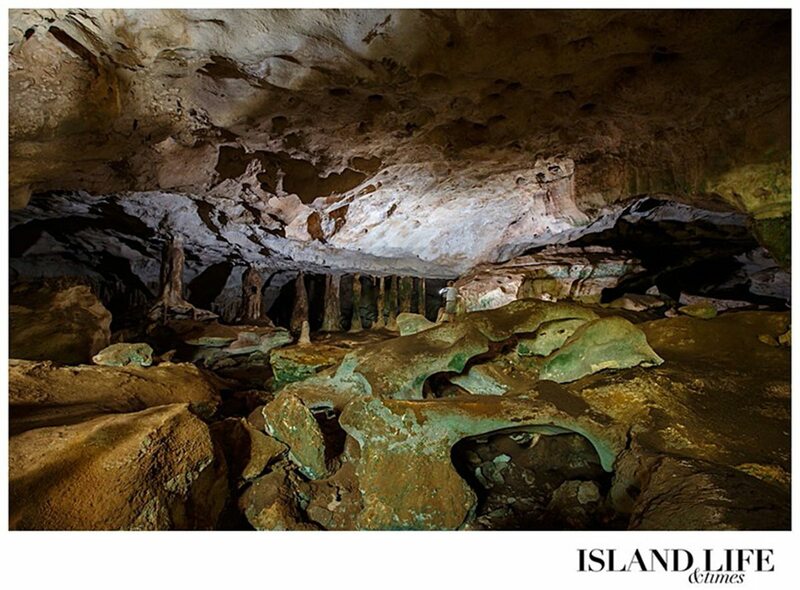 And perhaps more importantly, a cave system as old as the Conch Bar Caves – old enough, scientists believe, to have once been submerged in the ocean – also offers scientists an avenue for climate change research. “What a thing to be able to offer,” Mark says.